*The competition is only open to residents of Singapore, Malaysia, Thailand, the Philippines, Indonesia and Taiwan. Please read the Terms and Conditions contained in this document carefully. Your participation in this promotion constitutes your acceptance of the Terms and Conditions set out herein. All times stated are Hong Kong Time (GMT+8). Staff and immediate family members of the Hong Kong Tourism Board (‘HKTB’) and its representatives are excluded. 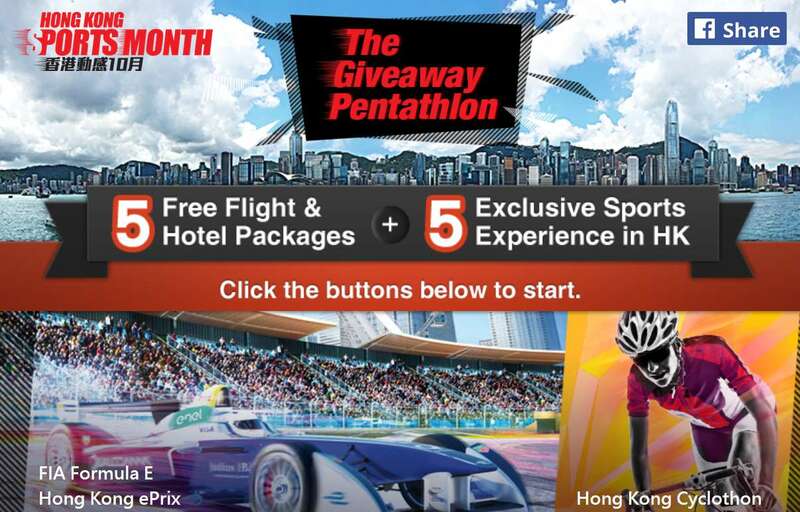 Participants have to enter the game through the ‘Win a Trip’ app tab on the Discover Hong Kong or “香港逗陣行” Facebook page. Part 1) Participants select a Hong Kong Sports Month Experience among the 5 Categories: Formula-E, Cyclothon, Tennis, Triathlon and Harbour Race. Part 2) Participants view facts of corresponding Sports Category or press “skip” button. Part 3) Participants write a message about Hong Kong based on the given Category in the app. The message should be within 200 characters in English or within 200 characters in Chinese. Part 4) Participants complete the entry form with their personal information (e.g. full name as shown on their travel documents, city and location of residence, phone number and email address). Each email address and phone number can submit one entry per Category. However, each participant can only win once during the entire game period. There will be one winner for each Category making a total of five (5) winners (‘Winners’) from all the Eligible Markets during the entire game period. Each winner will enjoy a complimentary three-day-two-night travel package for two people where they will be required to travel to Hong Kong on the dates stated in terms 3.III, 3.IV and 3.V. The travel companions of the Winners must be from the same Eligible Market and must be 18 years old or above for Malaysia, the Philippines, Singapore and Thailand; or 21 years old or above for Indonesia and Taiwan. 1. One flight and accommodation prize (‘Flight and Accommodation Prize’): Round-trip economy class flights for two persons to Hong Kong from a city of the Winner’s location of residence: Jakarta for Indonesia; Kuala Lumpur for Malaysia; Manila for the Philippines; Singapore; Bangkok for Thailand; and Kaohsiung or Taoyuan for Taiwan. Two nights’ complimentary stay hotel accommodation (‘Hotel Accommodation’) on a twin share basis in a Harbour View Room at The Excelsior Hong Kong with breakfast for 2 persons (adults). • 2 x Complimentary Registration to the 30 km Community Ride to be held on 25 September 2016 (Participation to the Ride is subject to the Winner and his/her travel companion’s passing the Cycling Technique Assessment to be held on 24 September 2016 or provision of proof on valid membership or experience in cycling. Details will be provided to the Winner in the notification email). • 2 x Grandstand tickets to attend the 2016 FIA Formula E Hong Kong ePrix on 9 October 2016. • 2 x Gold Tickets to attend the Hong Kong Tennis Open event on 16 October 2016. * In case Hong Kong Cyclothon, 2016 FIA Formula E Hong Kong ePrix Hong Kong or Tennis Open is/are cancelled by respective organiser due to inclement weather, an emergency situation, police advice etc, HKTB will contact the relevant Winner(s) as soon as practical when the cancellation notice is announced via the contact details provided by the Winner(s). HKTB shall not be responsible for any other compensation to the Winner(s) as a result of such cancellation. *Terms and Conditions listed on the winner’s notification emails, vouchers, tickets and redemption letters are to be applied. Participants who have completed all parts of the mechanics of the promotion will be eligible to compete for the Prize as specified in the Category for which the entry is submitted. For each Prize on offer, a judging panel from HKTB will select one person from all completed submissions of eligible participants by selecting the best answer from Part 3 to be the Winner. The judging criteria for Part 3 are as follows: A) Must be related to Hong Kong; B) Must demonstrate the participant’s enthusiasm or creativity for visiting Hong Kong; C) Must be pertinent to the given topic in the Category entered. Should a participant provide the best answers selected by the judging panel for more than one category, he/she will only be awarded as the winner for the earliest category he/she submitted in. Between 25 August to 8 September 2016, a representative from HKTB will send notification emails to the Winners. The representative will call the Winners within 24 hours of sending the notification email to confirm. For Winner of Hong Kong Cyclothon, the Winner must submit the documents and complete the registration form in accordance with the details as set out in the notification email. Should the Winners be unreachable within 24 hours as specified above, fail to confirm before the deadline specified on the notification email (within 24 hours) or be unable to travel on the dates stated in terms 3.III, 3.IV and 3.V, the Prize will be forfeited and rendered to the eligible participant with the next best answer in the same Category as selected by the judging panel. Each participant can enter once in each Category and each Category will have one winner. The results will be announced to the public via the Discover Hong Kong and “香港逗陣行” Facebook pages by 12 September 2016. Air tickets and hotel bookings must be completed by 10 September 2016. HKTB will coordinate with the Winners on the travel period for the flight and hotel booking. Once the bookings have been confirmed they cannot be changed. All components of the Prize must be taken together and redeemed during the same travel period of respective Category for the ‘Flight and Accommodation Prize’. The offers cannot be used in conjunction with any other promotions. Winners are responsible for all applicable taxes and fees associated with Prize receipt and/or use. Domestic transfers to and from the departing airports are the responsibility of the Winners. All expenses, unless otherwise specified, including meals, gratuities, excess baggage, travel insurance, personal and transport expenses, all taxes, fuel charges and any other incidental expenses in conjunction with the hotel stay are not included in the Prize. The Winners and their travel companions will be invited to attend interview(s) arranged by HKTB. The Winners consent to, and procure their travel companions’ consent to, the use of any photos, video and audio capturing their names, voice, photos and/or images by HKTB and/or worldwide media for publicity and other purposes deemed appropriate by HKTB. Prizes cannot be exchanged for cash and are non-transferable. Prizes are not for resale. In case of false or incorrect information provided, the submission will be disqualified and HKTB will not be responsible for any liability thereof. If such information brings any claim or damage to HKTB or any other third person, the person or persons who submitted such information will undertake all liability thereof. HKTB is not the supplier of the Prize and shall not be responsible for any liabilities in relation thereto. Any enquiry, claim or complaint in relation to the quality or delivery arrangement of the Prize shall be directed to the relevant supplier. Redemption and usage of the Prize is subject to the Terms and Conditions as determined by each supplier of the Prize. HKTB has the absolute right to substitute the Prize with an alternate prize of equal value. HKTB is not responsible for any matter in relation to submission delay, loss, and any information transmission error due to technical problems including but not limited to any computer or Internet network issues. HKTB has the right to modify the rules and contents of this promotion without prior notice. Related information will be announced on the Discover Hong Kong and “香港逗陣行” Facebook pages without prior notice. HKTB has the right to amend or cancel any of the above Terms and Conditions without prior notice. In case of any disputes, HKTB’s decision will be final. The participant is providing information to HKTB and the Prize sponsors and not to Facebook. By participating in the promotion, the participant accepts and agrees to be bound by the Terms and Conditions set out above. HKTB reserves the right to limit entry, amend rules or cancel, terminate, modify or suspend the contest without notice if considered necessary. In these Terms and Conditions, unless the context requires otherwise, the singular includes the plural and vice versa.